SpaceX test-fired a Falcon 9 rocket on June 15, 2017, prepping the booster for the planned launch of the BulgariaSat-1 communications satellite on June 19. The liftoff will be the second for this Falcon 9's first stage. SpaceX test-fired a previously flown Falcon 9 rocket Thursday (June 15), paving the way for the booster's planned second liftoff on Monday (June 19). 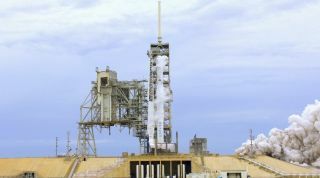 "Static fire test of Falcon 9 complete — targeting June 19 launch of BulgariaSat-1 from historic Pad 39A," SpaceX representatives tweeted today, referring to the pad at NASA's Kennedy Space Center in Florida that once hosted Apollo moon-mission launches and space shuttle liftoffs. The booster will attempt to pull off a similar double success on Monday. The primary goal of the upcoming mission is to get the BulgariaSat-1 communications satellite aloft, but SpaceX will bring the Falcon 9 first stage down for another "drone ship" touchdown attempt shortly after liftoff. These activities — and the reflight of SpaceX's Dragon cargo capsule, which the company achieved for the first time earlier this month — are part of Musk's vision to develop fully reusable launch systems. Such technology will cut the cost of spaceflight dramatically, potentially opening the heavens to exploration, Musk has said.